Many people have been expressing concerns about adverse environmental effects of the pipeline, including risks of spills, and climate and ecosystem effects of expanding tar sands oil production. 1. The Ontario Energy Board is holding hearings into the potential impacts of the project, and is coming to several communities along the proposed pipeline route, including Ottawa, to hear from resident and community organizations. There’s one on Monday, April 7, 2014, 6:30-9 p.m. at the Johnny Leroux Community Centre, 10 Warner Colpitts Lane, Stittsville (following a meeting with First Nation and Metis communities in Kanata on the same day from 12:30-4 p.m.). You can get details about the community hearing on the OEB website. Ecology Ottawa is encouraging people to attend, and you can contact them to get more information, or let them know if you’re interested in speaking. 2. 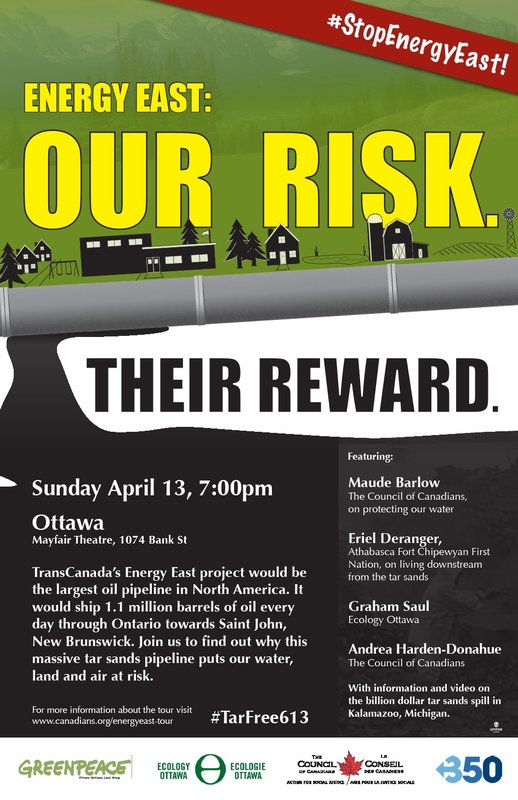 On Sunday, April 13, 2014, the Council of Canadians’ Energy East: Our Risk Their Reward comes to Ottawa. Speakers are Council of Canadians’ chairperson Maude Barlow, Eriel Deranger of the Athabasca Fort Chipewyan First Nation and Graham Saul of Ecology Ottawa. It’s at the Mayfair Theatre from 7-8:30 p.m. (doors open at 6:30). More information on the tour is here, and information on the Ottawa event here. TransCanada is holding its own open house on Energy East on April 3, 2014, 4-8 p.m.
You can find links to additional suggested actions at Ecology Ottawa’s Tar Free 613 site and on the Council of Canadians’ Energy East page.